Brooklyn Digest: Cashman On Ichiro: He had a "truly astonishing career"
Cashman On Ichiro: He had a "truly astonishing career"
Ichiro in Japan saying goodbye. 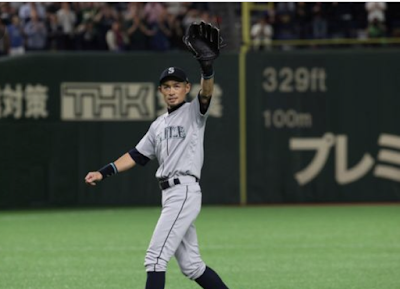 Ichiro Suzuki announced his retirement on Thursday morning after his Seattle Mariners beat the Oakland A's 5-4 in 12 innings in his native Japan. Ichiro played 18 years in the Major Leagues, starting in 2001 when he joined the Mariners after a career in Japan. He was traded to the Yankees during the 2012 season and stayed in New York until 2014. He then went to the Miami Marlins for three seasons before returning to the Mariners for the 2018 season. Ichiro, who had 3,089 hits in the Majors, played 360 games with the Yankees over two-plus seasons, and he hit .281 with 311 hits, with 13 home runs and 84 RBI.